Yesterday I spent the day making these. 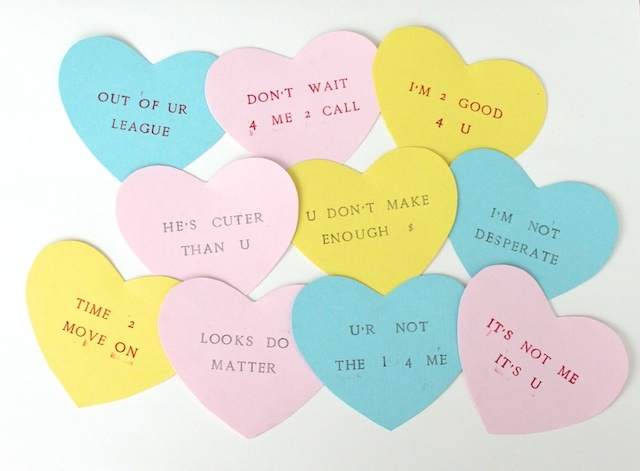 Bitter Valentine’s Day conversation hearts cards. You see, I have two little girls. And I thought it would be funny to make bitter conversation hearts for them to give out to all their little boyfriends. OK… so they are not really going to hand these out to their friends. It would hurt the little boys’ feelings. So maybe I’ll save these for when my girls are 14 or 16. I showed these to Nathan when he came home from work. He loved them. 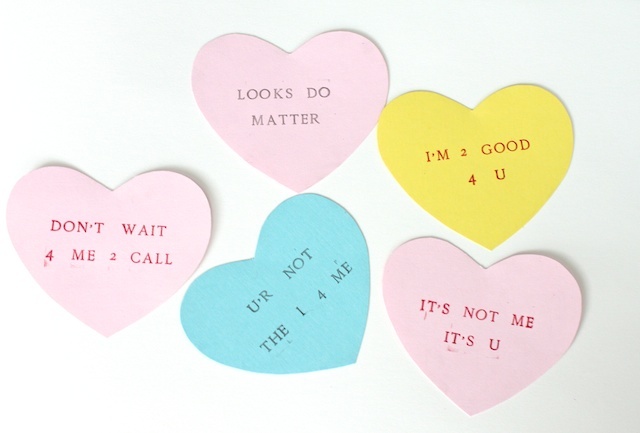 These are also great bitter Valentine’s cards for those who are single or trying to break up with someone. But all these are meant only as jokes. Not to be taken seriously. Tomorrow, I’ll show you the accordion envelope I made for these cards. » Tell me… Did you make your children’s Valentine’s cards or were they store bought? Could you think of other clever phrases for bitter Valentine’s that I should make? Tiffany, you do not have to publish this comment. I am a long time subscriber and I have never commented on anything, but felt compelled. I like to think I have a healthy sense of humor as well. Handing these out to adults – yes, very tongue in cheek. Handing these out to children the ages of which you have – no. Not funny, in the least. Some may find it so, but if you want to err on the side of not angering all your children’s classmates parents, I would keep them at home as a joke between you and Nathan. Thanks for reading this – I love your blog because your values are aligned with mine, and we have children about the same age. I think you just got carried away with this idea before thinking it over from the other point of view. hi erin, thanks for your comment and concern. my girls aren’t really going to hand these out to their friends because i think many of the parents would be offended. my kids aren’t in school yet so it’s not something that’s going to be mass distributed. it was just something funny i made to lighten valentine’s day. sorry if you didn’t find it funny. I definitely agree that Nate should hold onto a couple of those when the girls start dating……to funny. Funny idea. Definately for an older crowd. Love those! Gotta have a little adult fun while helping the kiddos. My co-workers would fall off their chairs laughing if I handed something like that out. All in good fun. Holy Hilarious!!! I love them! And on a side note… Love the new hair cut! hahaha, i think that these are super cute, i know you weren’t posting these for something to do with your kids. lol, what I would done to have these in my 20’s too 😀 my boyfriend and i laughed a lot on these, 😉 props to the creativity! I LOVE THESE!!! They were hilarious. These are awesome! Thanks so much for sharing. haha. Love them and am using them for my anti-valentine’s day party tonight!! Loved them. Very cute. Here is one : U R not a QT.